Eastleigh Football Club is delighted to announce the signing of Lee Phillips from Bath City until the end of the season. The 31-year-old striker will be available to manager Ian Baird for selection for this Saturday’s vital home match at the Silverlake against Farnborough as the Spitfires continue to attempt the impossible mission of a playoff place this season. Phillips was born in Cornwall and was an exceptional sportsman from a young age. He started his sporting career playing rugby union for England at both under 15’s and Under 21 levels. However, he soon concentrated his attention on football, signing professionally with his local club Plymouth Argyle in 1996 and made over 50 appearances for the Pilgrams. While at Plymouth he suffered a career threatening broken leg but recovered and joined Conference side Weymouth in January 2001 where he made 67 appearances scoring 33 goals. Eastleigh's Bradley Bubb has been named the Blue Square Bet South 'player of the month' for February. Striker Bubb has been in fantastic form for the Spitfires following his loan move from Aldershot. After a debut goal in a 3-2 win against local rivals Havant & Waterlooville, he went on to score five more times including braces against Staines Town and Truro City. Bubb also contributed with a number of assists as Eastleigh, unsurprisingly, look to extend his time on the south coast. Farnborough boss Spencer Day has been named the Blue Square Bet South 'manager of the month' for February. Day's side had a 100% record for the month with wins away at Staines Town and Thurrock followed by a home success over Tonbridge Angels. A result which took their winning run to four straight matches as they moved into mid-table. Farnborough, who were recently docked five points, will visit the Silverlake Stadium this Saturday in what is Eastleigh's next game. “In the first half we played very well attacking-wise, but I expected Truro to come out and have a go at us,” said Baird. "We conceded 14 free kicks in the second half and Truro kept getting the ball into good areas which was difficult to defend. The pressure was lifted on 88 minutes Bubb was sent clear by an excellent ball out of defence from his former Farnborough teammate Daryl McMahon and coolly beat keeper Oliver Chenoweth one-on-one. “When you look at Bradley’s goal ratio he’s done ever so well and he’s a bit disappointed he didn’t get a hat-trick today,” said Baird. Eastleigh bounced back from defeat at Salisbury City to claim all three points against Truro City and move up to sixth in the Blue Square Bet South. The Spitfires have been in excellent form at home in the league for a long spell now and today's victory was Ian Baird's third win in a row at the Silverlake Stadium. Eastleigh made one change to the side beaten 2-0 on Tuesday night with Jamie Brown replacing Philip Appiah in midfield. Gary Elphick made his home debut partnering Tom Jordan at the heart of the Eastleigh defence. Before the game, a minutes silence was well observed in the memory of ardent Truro City supporter Gillian Alderman who tragically passed away last week. In the opening stages of the game - Truro’s Les Afful managed to get goal-side of Mitchell Nelson and looked to be held back in the area, though referee Adrian Quelch waved play on. Ian Baird’s Spitfires take on Truro City at The Silverlake Stadium tomorrow in the Blue Square Bet South (3pm kick off) and Eastleigh are looking to get back to winning ways after a disappointing result against rivals Salisbury City on Tuesday. The Spitfires started brightly at the The Raymond McEnhill Stadium, however Salisbury took the advantage after 33 minutes. Stuart Sinclair slotted past on-loan Southampton keeper Jack Dovey to put the home side in front. With Eastleigh having most of the possession, it looked destined for another 1-1 draw between the two teams but The White’s second half substitute Dan Fitchett ran down the left wing five minutes from time and squared the ball to Abdubai Bell-Baggie who made no mistake with the finish. By Simon Walter- Eastleigh suffered a shock first defeat in six games at rivals Salisbury City last night. The Blue Square South derby provided a big chance for the nouveau-riche Spitfires to show Old Sarum why they have such a bright future. But instead Salisbury, including two debutants and returning favourite Charlie Griffin, completed a deserved 2-0 win. Stuart Sinclair and Abdulai Bell-Baggie scored their first Salisbury goals to dampen Eastleigh's slim play-off hopes. Midfielder Sinclair had gone close at the near post before opening the scoring. He was allowed to run unchallenged before cutting in from the left to fire low inside Jack Dovey’s near post. Dovey got his finger tips to the ball but not enough to prevent it squirming in. Eastleigh failed to test new Salisbury goalkeeper Mark Scott until the 79th minute, but hit the woodwork twice in quick succession in the first half. IAN Baird has had his ups and downs with Andy Forbes during his four-and-a-half years in charge of Eastleigh. But the Silverlake boss was brimming with praise for Forbes following Saturday’s 4-0 romp at second-to-bottom Hampton & Richmond which lifted the Spitfires to eighth in the Blue Square Bet South. Forbes, once a prolific striker, rejoined the club last summer, principally as centre-half, and for much of this season has done a solid job alongside skipper Tom Jordan in the heart of defence. But, with Baird opting to give Michael Green a rest, he was asked to fill in at left-back on Saturday, allowing new signing Gary Elphick to partner Jordan. The 32-year-old’s response was to serve up a near faultless performance which had his manager drooling. “Andy Forbes was outstanding,” said Baird. “He’s a multi-talented footballer who, in my opinion, should have achieved a hell of a lot more. Eastleigh recorded their best away league victory of the season against the side currently second from bottom of the Blue Square Bet South Division. Hampton had replaced the side that Eastleigh had travelled to in midweek, Staines Town, in that lowly league position and although still below their best performance, Eastleigh produced enough to wipe away their lowly opponents. With Scott Rogers not available with a bout of the flu, Michael Green found himself relegated to the substitutes bench with Gary Elphick coming in to make his full debut alongside skipper Tom Jordan in the centre of the Eastleigh defence with Andy Forbes moving to left back. Graeme Montgomery was recalled to the side to fulfil one of the two wide roles allowing Daryl McMahon to switch to a central midfield position. Eastleigh's home match against Tonbridge Angels, which was postponed on Saturday 11th February because of the weather, has been re-arranged for Tuesday 20th March @ 19:45pm. 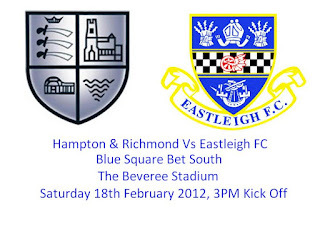 Ian Baird's Spitfires take on second from bottom placed Hampton & Richmond Borough in the Blue Square Bet South at The Beveree Stadium today (3pm kick off). Eastleigh made the trip to Staines Town on Valentine's day at Wheatsheaf Park and The Spitfires didn't get off to the best of starts. David Wheeler put the home side in front and things went from bad to worse when former Spitfire loanee doubled The Swans' lead in the second half. Second half substitutes Jamie Brown and Graeme Montgomery came on for for Jamie Slabber and Michael Green and Eastleigh went to three at the back. Damien Scannell got pulled down in the box and earned The Spitfires a penalty and Bradley Bubb scored his fifth goal in five appearances for The Spitfires. IAN Baird says Eastleigh's travelling "circus" must do better on the road if they are to stand any hope of reaching the Blue Square Bet South play-offs. The Spitfires are a potent force at home, unbeaten in their last ten league matches at the Silverlake Stadium. But Eastleigh's last league away win was back on November 12 at Farnborough since when they have picked up just two points from a possible 15 on their travels. As Tuesday's 2-2 draw at relegation-threatened Staines Town demonstrated, no opposition can be taken for granted - particularly when, in Baird's words, "the circus is coming to town." "As another manager said to me, everyone's seen what's happening at Eastleigh and what we're trying to achieve and they know the bar has been raised," said Baird. "Teams have a different mindset about playing us and we've got to learn to deal with that. TWO late Bradley Bubb penalties salvaged Eastleigh a 2-2 draw at Staines Town on Tuesday night, stretching their unbeaten Blue Square Bet South run to four games. It looked like it might be curtains for Ian Baird's men when David Wheeler fired the Swans into a 22nd-minute lead and ex-Spitfires loanee Mark Nwokeji doubled the hosts' advantage 11 minutes after the break. But Eastleigh upped their game in the last 20 minute and were rewarded when Bubb twice beat keeper Rhys Evans from 12 yards in the 76th and 81st minutes. On both occasions it was Damian Scannell who was fouled, first by Wheeler and then Evans. The Spitfires could have gone one better and actually won the game, but skipper Tom Jordan blazed a late header over from Daryl McMahon's cross. "For 70 minutes we played very poorly from one to eleven when we had possession, which was disappointing," admitted Eastleigh boss Ian Baird. Eastleigh ended up with a point against a Staines Town side that currently lie in second bottom position of the Conference South table. Although on paper this would look like two points lost, the true facts are that this Staines Town side belie their league position considerably as Eastleigh recovered from a two-goal deficit to take a point. Not to defend Eastleigh - this was not a quality performance that has been shown of late, but their team work to get back into the game is good news for the future. Keeping the same side that had defeated Havant & Waterlooville seven days earlier, whilst for Staines this was their first league game for seventeen days and showed three changes from their last fixture with a debut for ex-Luton Town centre back Will Antwi. Eastleigh boss Ian Baird is convinced 19-year-old goalkeeper Jack Dovey will return to Saints a more battle-hardened player after a toughening up season in the Blue Square Bet South. Totton lad Dovey, who joined Eastleigh on loan from Southampton last October, impressed Baird with the way he stood up to a second-half onslaught against Havant & Waterlooville last week. "Havant went gung-ho in the second half, pushed four up front and threw everything at us and Jack showed real maturity in dealing with it," said Baird. "To come under a bombardment like that on a concrete pitch on a freezing cold night will stand him in good stead for the future. Ian Baird’s Spitfires take on second from bottom of the table Staines Town tomorrow night in the Blue Square Bet South at Wheatsheaf Park (7:45 pm) on Valentines night. After Saturdays encounter between Eastleigh and Tonbridge Angels was called off due to a frozen pitch, Eastleigh will certainly like to claim all three points tomorrow night. Victory for Baird's side could see the Spitfires only four points from the play off’s if Boreham Wood do beat Sutton United on the same night. The last time Eastleigh played was last Tuesday night where they beat Hampshire rivals Havant & Waterlooville at the Silverlake Stadium. Meanwhile, tomorrow's opponents The Swans have not played a game in more than two weeks where they were narrowly beaten by Cornish side Truro City 2-1 away at Treyew Road.